Since Thomas Piketty’s best-selling book Capital took the world by storm in 2014, the issue of inequality – and the wide range of problems it causes – has been top of the political agenda. Much of that debate has focused on the so-called one percenters , the 1% of the world’s population who control half its wealth. Less has been said about inequality among some of the most vulnerable members of society: children. And yet we know that a lack of opportunities as a child can affect someone for the rest of their lives, increasing the risk of economic hardship and unemployment in the future . It’s to shed some light on this important part of the debate that UNICEF has carried out a comprehensive study of inequality among children living in rich countries. The report – which covers everything from educational opportunities to family income – reveals that some of the world’s wealthiest countries are failing their children. These charts provide a snapshot of the full findings . The first of the tables in the report ranks wealthy countries based on the relative income gap for households with children. According to UNICEF’s methodology, in almost half of the world’s richest countries – including the wealthiest nation, the US – the gap is higher than 50%. It also looked at child poverty rates, defined as those children living in households with incomes below 50% of the national median. In some rich countries, as many as a quarter of children are living in poverty. The report found the income gap in households with children had widened in most rich countries over the past few years. Education: still the great equalizer? 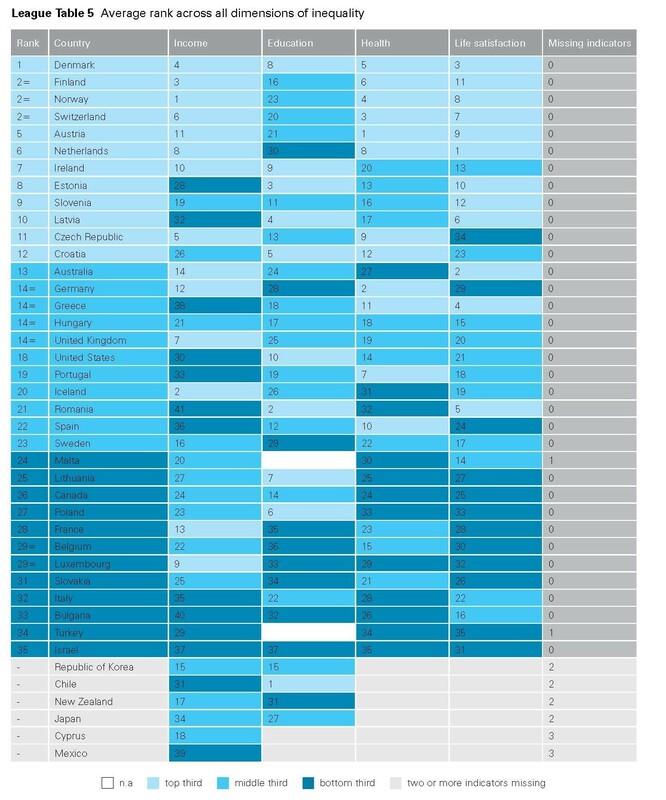 The second table from the report ranks countries based on their educational achievement gap, using the OECD’s PISA tests, which measures performance in reading, mathematics and science. While Chile and Romania have the smallest gap, they also have a much higher rate – almost a quarter – of children failing to reach the standard expected of their age group. Unlike the income inequality gap, there’s good news when it came to educational opportunities: “Inequality in educational achievement narrowed in the majority of the countries,” the report finds. The final table used by UNICEF to calculate the extent of child inequality in rich countries compares the relative life satisfaction gap. It also shows the proportion of children reporting very low levels of life satisfaction (4 or less out of 10). The Dutch not only have the narrowest gap, but they also have the smallest proportion of children who say they are unhappy in life. 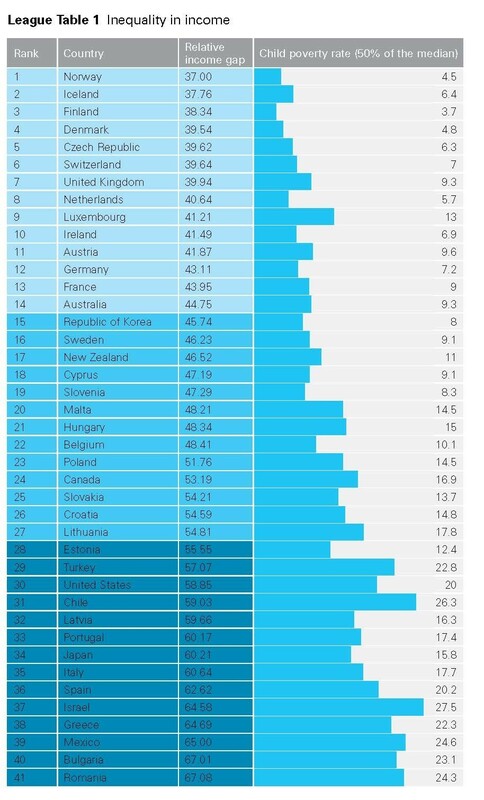 Turkey has both the biggest gap and the highest number of children saying they are unhappy. 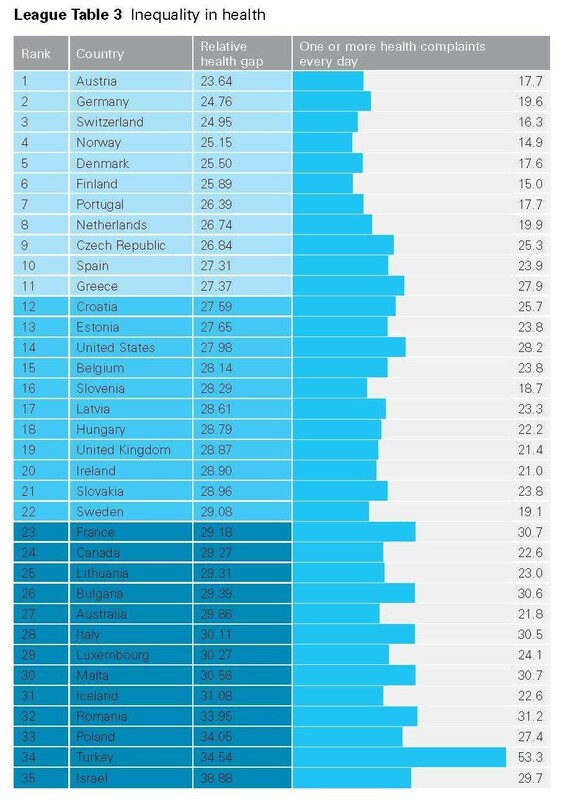 Overall, though, the picture is positive: in almost all countries, the average child gave an 8 out of 10 when asked about their life satisfaction. When all four measures are added together, the final results might come as a surprise. While a country as wealthy as the US should be scoring higher than 18th, it is also regularly lambasted for its performance when it comes to inequality. 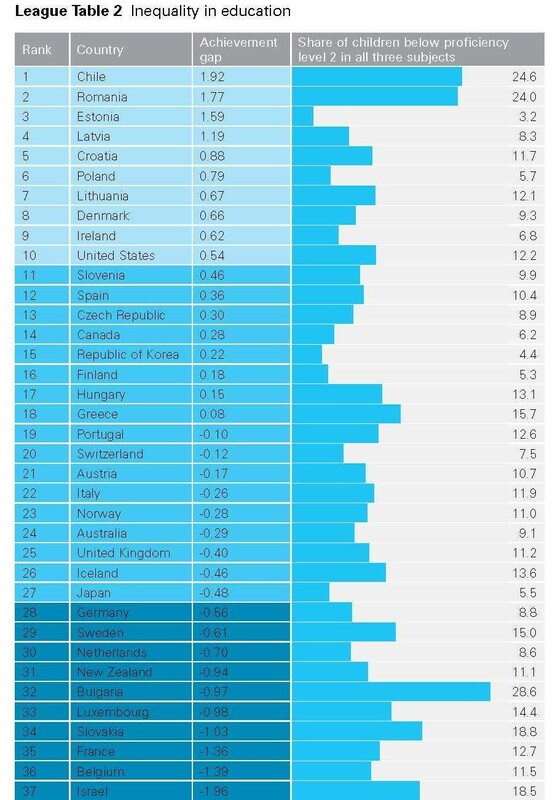 And yet some countries that are thought of as having more progressive approaches when it comes to income redistribution rank even lower. 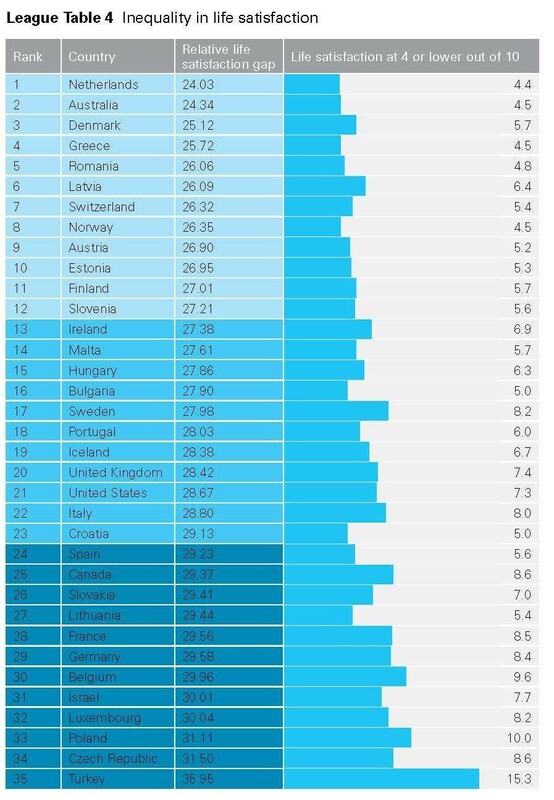 For example, Canada, France and Italy – all G7 economies – rank in the bottom third of the overall table, as does Luxembourg, the EU country with the highest income per person.